Earlier this month, we harvested and crushed Zinfandel from Santa Clara Valley and Pinot Noir from the Santa Cruz Mountains. 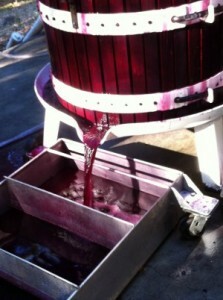 Since then, the grapes have been going through primary fermentation in open top fermenters. We have been punching down the cap by hand three times per day as it is important to keep the pulp and skins in contact with the juice (officially called “the must”) for maximum color and flavor extraction. Yesterday, we pressed the grapes and moved the wine to holding tanks, where sediment will settle to the bottom before we move the wine to barrels for aging. Today, we will be harvesting Chardonnay. Stay tuned for updates later.